Association of the word adipocyte usually refers to the lipid-filled cell, found in high concentrations in various body locals. Moreover, these cells have been associated with consumption of excess calories and with a variety of metabolic maladies like diabetes, metabolic syndrome and cardiovascular disease. Knowledge about the cellular and molecular dynamics of adipocytes would benefit numerous disciplines. For the present paper, we have focused on animals. However, much of this information is directly extrapolated to other mammals, including humans. For all animals, adipocytes are primarily derived from mesodermal stem cells during embryogenesis. Embryonic and fetal cell migration into the general anatomical location, development of initial adipocyte-like structures (rather than resemble hematopoietic tissue), and basic adipose architecture establishment (some lipid-filled adipocytes, connective tissue, blood vessels, accessory cells such as preadipocytes, monocytes and macrophages) allow adipocytes to function to metabolize lipid. Postnatally, adipocytes are found in specific adipose depots [subcutaneous, visceral, intermuscular and intramuscular]. These depots possess different cellularity and ability to respond to/produce regulatory signals and metabolize lipid. They develop and grow at different times, are regulated differently, and possess a different propensity to metabolize lipid. However, they all share one common thread: their cellularity is a direct function of cells that may become committed to expressing the adipocyte phenotype. A cell fraction that serves as the precursor to a majority of adipocytes of the adult is called the stromal-vascular (S-V) cell fraction. While much used as a system to study the step-by-step progression of cellular changes occurring in adipogenesis, S-V cells, in vivo, play much more of a regulatory role than once thought. Results from studies on fetal porcine adipose tissue development provide information on S-V cell development and interaction with other cell types. Reviewing the fetal pig model, in this regard, is a unique and distinct aspect of this review since there are no other models where in vivo and in vitro studies have been utilized before overt adipogenesis and throughout adipogenesis. For example, in pigs the development of cells of the S-V lineage precedes overt adipocyte differentiation in 45 or 50 d fetal adipose tissue , and when adipogenesis is finally evident at 60 d, in utero, S-V elements and cells continue to develop in parallel to discernable adipocytes . Several solid reviews are available that thoroughly describes embryonic/fetal adipose tissue development [2,3], and adipogenesis in a variety of animals [2,3]. Moreover, primary cell cultures of fetal adipose tissue S-V cells are commonly generated from all fetal ages examined including 50 d which provides a chronological sequence of events in S-V cell development and regulation of adipogenesis . Primary cultures of adipose tissue S-V cells are also generated from various adipose tissue depots of humans and growing rodents [5,6]. During isolation, a variety of cells are present in the S-V cell pellet which may vary between different tissue preparations . The S-V cell pellet is obtained after centrifugation of the collagenase-digested tissue. The pioneering work of Prunet-Marcassus et al. and Planat-Bernard et al. suggested that adipose tissue contains a number of progenitor cells that can give rise to different phenotypes in addition to a large population of macrophages and hematopoietic progenitor cells. Additionally, mesenchymal stem cells (MSC) and a significant proportion of immature (ill-defined) cells are found in adipose tissue cell isolates. Most remarkably, these authors demonstrated that adipose tissue derived stromal cells (ASC) can give rise to endothelial cells and adipocytes among several other phenotypes . Furthermore, the phenotype of adipose tissue cell populations was depot dependent indicating that yet another major characteristic could be noted that distinguishes adipose tissue depots from one another . Adipose tissue-derived S-V cultures provide powerful tools to harvest ASCs and adipose tissue-derived stem cells (ADSC) and examine their interaction with vasculogenesis and adipogenesis. As such, this review focuses on regulation, physiology and transcriptome/proteome of cells in the S-V fraction of adipose tissue and their role in regulating adipogenesis. Fetal adipose tissue S-V traits before adipogenesis. In the fetal pig, the development of several layers of dorsal subcutaneous adipose tissue (outer and middle, inner) is characterized by a loose arrangement of small collagen fibers, immature cells and a sparse vasculature . Cells from vasculature origin, express laminin and type-IV collagen proteins and bind plant lectins like Griffonia simplicifolia-1 (GS-1) that that typically identify capillary endothelium . Immunoreactivity for a preadipocyte marker (AD-3 antibody) indicated a sparse number of preadipocytes present as either strands/cords or isolated cells . The dorsal subcutaneous collagen layer is the thickest in the cranial region and the thinnest in the caudal area ; (Figure 1). This pattern of development of S-V cells (vascularity and collagen deposition) is maintained throughout growth with expansion of each subcutaneous collagen layer such that fetal subcutaneous layer development is predictive of the degree of adipocyte development in each layer postnatally  (review). In man, subcutaneous adipose layers have not been studied during fetal or postnatal development, but are recognized as distinct and important compartments of the subcutaneous depot . In related studies it was shown that the relative degree of type-1 collagen deposition in intramuscular locations in the semitendinosus muscle in the fetal pig (36 - 86 d) was predictive of type-1 collagen deposition in intramuscular locations in growing pigs [12,13]. These authors determined that IGFBP-5, IGF-1, PPARγ and myostatin may play roles in directing the deposition of type-1 collagen deposition and/or adipose tissue in fetal pig muscle intramuscular locations . In fetal adipose tissue prior to adipogenesis, IGFBP proteins were detected (especially IGFBP-2,-3) and IGFBP and IGF-1 proteins were secreted by primary S-V cell cultures (in vitro) indicating a likely involvement of the IGF system proteins in collagen deposition . Furthermore, TGFβ1 protein and mRNA was detected around developing blood vessels in fetal adipose tissue suggesting that TGFβ1 may stimulate fetal angiogenesis . Fetal dorsal subcutaneous adipose tissue stained for collagen from a 50 day old pig fetus. A, Whole dorsal subcutaneous adipose tissue from an area cranial and dorsal to the first costa, B, The area delineated by arrows in A is shown at a higher magnification. C, Whole dorsal subcutaneous adipose tissue from an area over the last costa, 27 X. Note the thicker inner layer ( i, arrows) in the more anterior adipose tissue (A vs C) and the poorly organized collagen fibers (f) in adipose tissue at this age. e = epidermis, m = muscle, sp = spinal process. Transcription factor expression included PPARγ protein expression in the nucleus of a small number of cells in vitro (fetal S-V cell cultures) and PPARγ protein expression in vivo despite the absence of lipid-filled adipocytes [15,16]. Additionally, C/EBPα protein was detected in vivo and C/EBPα reactive cells were present in vitro, but not yet clustered [16,17]. Clearly, fetal S-V cells expressed and secreted numerous factors that may be involved in the development of subcutaneous adipose tissue S-V developmental gradients. S-V traits after the onset of fetal adipogenesis. Cranial to caudal and ventral to dorsal developmental gradients develop for collagen septa formation and adipocyte cluster development (Figure 2). 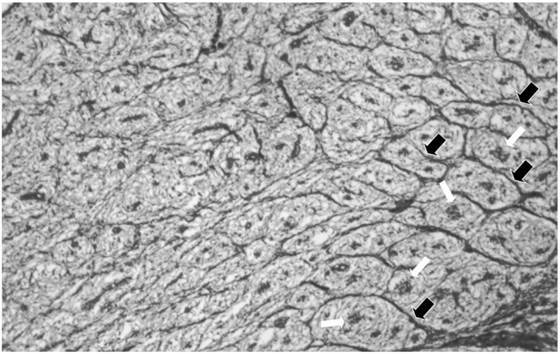 There is little collagen between the collagen septa and adipocyte clusters [Figure 2]. 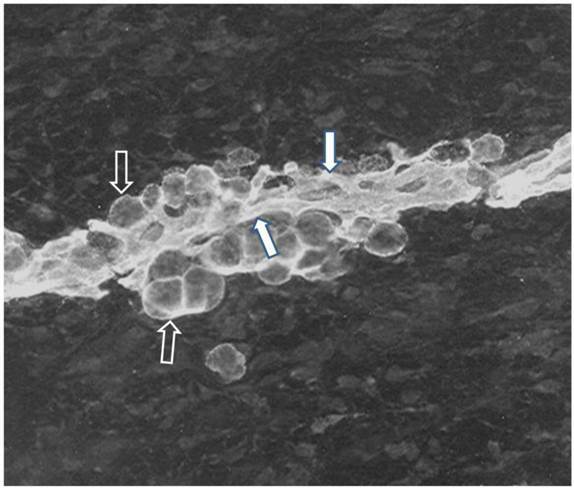 However, the collagen septa separates and organizes developing adipocyte clusters creating collagen “tubes” that are parallel to the long axis of the body ; (Figure 2). The development of the collagenous septa is depot- or location-dependent with the densest collagen in the innermost subcutaneous layer at the end of fetal development . This dense collagen reduces vascular cell development (ie., capillary elaboration and growth), which is associated with small adipocyte clusters in contrast to a reduced collagen deposition and greater capillary elaboration in larger adipocyte clusters in the middle layer of adipose tissue . Removing the fetal pig hypothalamus at 45 d considerably reduces collagen deposition, but enhances fat cell cluster development, which includes increased fat cell number and associated blood vessel elaboration and maturation in the innermost subcutaneous when examined at 110 d of fetal life while reducing adipocyte cluster growth in the middle and outer layers . Therefore, the extensive collagen deposition in the inner subcutaneous layer restricts local fat cell cluster growth, while reduced collagen allows or fosters growth of adipocyte clusters and elaboration of associated vasculature in the middle and outer layers of subcutaneous adipose tissue. Interactions of S-V cells during development of fetal adipocyte clusters. Adipocyte development is tightly coupled with the expanding and elaborating vascularity during adipocyte cluster growth. In fact, immunofluorescent staining revealed that all preadipocytes/adipocytes, associated capillaries and perivascular cells expressed the AD-3 antigen throughout fetal adipose tissue development [Table 1; Figure 3]. A number of other animal model studies identify adipose tissue progenitor cells in vivo (Table 1). Additionally, there is considerable and diverse evidence of the close relationship and interaction between developing adipocytes and vasculature [Table 1]. For instance, adipogenesis and angiogenesis were reciprocally regulated following implantation of 3T3-L1 preadipocytes into a mouse dorsal skin-fold chamber . Fetal dorsal subcutaneous adipose tissue from an area cranial and dorsal to the first costa stained for collagen from a 75 day old pig fetus. The area to the right is near the bottom of the inner area. Note that fat cell cluster development (white arrows) is associated with the formation of collagen septa (black arrows) surrounding the fat cell clusters. Note the absence of collagen septa as you proceed to the top of the inner layer. X 50. Immunofluorescence of subcutaneous adipose tissue from a 75 day old pig fetus. Cryostat sections were stained for the AD-3 monoclonal antibody (Mab) and then incubated with FITC-conjugated goat anti-mouse IgG3. Stained sections were mounted in Elvanol and examined using a fluorescence microscope. Immunoreactive capillaries and adipocytes are obvious in a developing adipocyte cluster after the onset of adipocyte differentiation in the fetus. Immunoreactivity for AD-3, a preadipocyte marker, clearly indicates that both of the adipocytes (black arrow, white trim), associated capillaries (white arrow, black trim) and probably perivascular cells express the AD-3 antigen indicating a common lineage for capillary endothelial cells preadipocytes and perivascular cells. Note the close proximity of adipocytes and capillaries indicating that the proximity was even greater earlier in development. Note the absence of immunoreactivity in areas distal to the adipocyte cluster.Staining was not observed using the FITC-conjugated second antibody alone or in conjugation with an isotype-matched control MAb. Animal models that identify adipose tissue progenitor cells in vivo. Anti-adipocyte monoclonal antibody staining in fetal and postnatal pig adipose tissue . Expression of adipocyte surface antigen indicates common lineage for preadipocytes, capillary endothelial cells and other stromal cells. CD29+; CD34+ ;Sca1+; CD24+ cells isolated from the adipose stromal vascular fraction of mice followed by injection of these cells into residual fat pads of A-Zip lipodystrophic mice . Reconstitution of adipose tissue in A-Zip lipodystrophic mice with CD24+ cells which are localized in perivascular location. Adipocyte progenitors studied in SV particulates from PPARγ-GFP mouse adipose tissue and in PPARγ-GFP adipose ; Adipogenic potential of adipose tissue SV cells from PPARγ-GFP mice evaluated . Adipocyte progenitors are located in the mural cell (pericytes and smooth muscle cells) compartment of the adipose tissue vasculature. Living tissue imaging: confocal microscopy- based three-dimensional visualization in vivo in db/db mice . Adipogenic/ angiogenic clusters contain EC's and stromal cells and are sites of active angiogenesis. Anti-VEGF inhibited angiogenesis and formation of adipogenic/ angiogenic clusters. Furthermore, electron microscopic studies verified close physical relationships between developing adipocytes, developing blood vessels and perivascular cells (Figure 4, ). Close intercellular contacts, distinct from intercellular contacts between endothelial cells, were evident between adipocytes and perivascular cells and between perivascular cells and endothelial cells . Perivascular cells wrapped around capillaries with either thick or thin cell processes [Figure 4]. In studies of young pig S-V cell cultures, staining for lipid and the AD-3 antibody revealed notable morphological aspects of lipid-free preadipocytes and cell-to-cell connections or interdigitations between preadipocytes and preadipocytes and between preadipocytes and adipocytes . Furthermore, the majority of human adipose tissue resident pericytes (CD34+) are involved in vascular stabilization by mutual structural and functional interaction with ECs . Another remarkable feature included long contiguous cell processes between preadipocytes that clearly traversed over or under non-preadipocytes . Similarly, studies of human ASC described long contiguous cell processes comparable to pig preadipocyte processes . Optical sectioning with confocal imaging confirmed that native human ASC exhibited a branched morphology with several lateral protrusions some of which allowed them to form networks surrounding mature adipocytes . Therefore, pig preadipocytes and human ASC may form perivascular network much like perivascular reticuloendothelial cells [21,23]. Interaction of arteriolar and connective tissue development in fetal internal adipose tissues. In perirenal and other internal adipose depots the interaction of arteriolar and connective tissue development dictates adipocyte cluster growth. Adipocyte cluster size and capillary elaboration decreased with distance from the entry points of large blood vessels . Adipocyte size per se was not influenced by proximity to entry points of large arterioles. Therefore, adipocyte number and capillary growth were positively associated with reduced distance to the entry points of large blood vessels . Gene and protein expression after the onset of fetal adipogenesis. In fetal adipose tissue after adipogenesis five IGFBP proteins were detected in vivo and in vitro: IGFBP-1-5 . Moreover, IGF-1 was secreted in vitro and IGF-1 mRNA was detected in small adipocytes, stromal cells and endothelial cells . Furthermore, TGFβ1 protein and mRNA was detected in adipocytes and stromal cells around developing blood vessels . Expression of C/EBPα protein was increased and, unlike before adipogenesis, C/EBPα reactive cells are clustered in vivo and in vitro. No change in PPARγ protein was evident in vivo but there was an increase in PPARγ reactive cells in vitro [15,16]. Microarray studies indicated that S-V cells expressed over 50 genes encoding for secreted factors detected in vitro (fetal S-V cell cultures) at 90 d of fetal development [Hausman unpublished data], and S-V cells expressed over 150 genes encoding regulatory proteins in vitro at 90 d. Clearly, fetal S-V cells expressed and secreted numerous factors that may be involved in the maintenance of subcutaneous adipose tissue S-V developmental gradients. Studies of S-V/stem cells derived from collagenase-digested adipose tissue. Considerable effort has been focused on improving the isolation of ADSC from adipose tissues, but there is little consensus on the optimal method for isolating and culturing highly homogenous and undifferentiated ADSC [25,26,27]. Since the first studies of isolating preadipocytes from adipose tissue began nearly 40 yr ago a variety of methods have attempted to increase the purity of isolated ADSC and identification methods have improved considerably . The ideal preparation for studies of ADSC contains a high purity of ADSC relative to total adipose tissue stromal cells. Using collagenase digestion and adherence screening, isolated ADSC should proliferate at a high rate and maintain a multipotent differentiation capacity in vitro for up to 12 passages . Therefore, ADSC and ASC are distinct in regards to the proportion of multi-potential stem cells. However, S-V cells, derived from rat inguinal adipose tissue may actually give rise to osteoblasts, endothelial cells, adipocytes, hematopoietic cells, and cardiomyoblasts . A recent review critically evaluates the future development process for therapeutic applications of adipose-derived stem cells and reviews the status of current clinical trials . 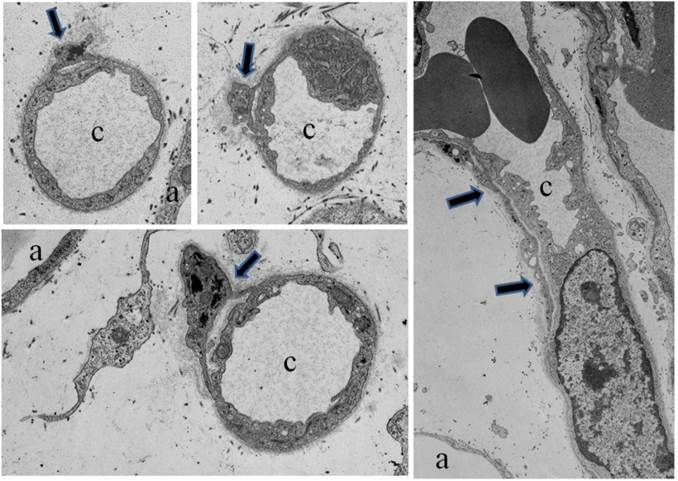 Electron micrographs of developing fetal adipose tissue demonstrating perivascular cells (black arrows) in cross sections of small capillaries (c). Note the cell processes of the perivascular cells interacting with the capillaries. Also, a perivascular cell (black arrows) in longitudial section surrounding a capillary in the far right panel. Also indicated are adipocytes (a). Studies of adipocyte progenitor stem cell phenotype with commercially available cell surface markers. Commercially available cell surface markers have used to identify stem cell progenitors of adipocytes primarily in studies of human and mouse adipose tissue progenitor cells. An adipocyte stem cell phenotype is established by reactivity for several cell surface markers and/or the absence of reactivity for others. Mouse white adipocyte stromal vascular cells were used to identify adipocyte stem cell progenitors  by using FACS to analyze the expression of cell surface markers and isolating two cell populations, one CD24+ (lin-:CD29+:CD34+:Sca-1+:CD24+) and one CD24-, that were capable of becoming adipocytes in vitro. Similar cell surface markers were expressed by precursor cells isolated in another mouse study . Rodeheffer et al. transplanted FACS-sorted adipocyte stem cell subpopulations into the fat depots of A-Zip lipodystrophic mice to determine whether the donor cells could develop into adipocytes in vivo. Injection of the CD24+ precursor cells resulted in the development of morphologically normal fat depots whereas the CD24- and CD34- populations failed to reconstitute WAT. It should be noted that injection of CD24+ precursor cells into wild type/normal mice did not induce fat depot formation. A review of eight studies that collectively included six species ( mice, humans, chickens, pigs, goats and rats) demonstrated variability as to which adipocyte stem cell surface markers consistently identified stem cells across species [30,31,26,28,32,33,34]. Over 15 cell surface markers were used in these studies. Across the species and studies only CD44+ and CD29+ were expressed by adipocyte stem cells in all species and all studies. The CD34 marker was expressed by adipocyte stem cells in three studies [34,35,28] whereas the absence of CD34 served to identify adipocyte stem cells in four studies [36,32,26,31] In a study of human bone marrow and adipose tissue MSCs, a panel of 22 surface antigen markers was examined with flow cytometric analysis . MSCs from both tissues had cell surface marker expressions that included many cell surface marker expressions reported in the studies discussed above. However, the MSC expressions of these cell markers were not different from HS68 fibroblasts . Therefore, surface antigen markers may depend on the species and may not accurately define adipose tissue stem cells. Furthermore, the availability of cell surface marker antibodies for a given species may limit the utility of such markers. Human adipose tissue stromal/stem cell and lineages: adipocyte and adipose tissue genesis. Recent studies of human adipose tissue collagenase preparations provided insight into the relationship between adipose tissue stromal/stem cells and adipogenesis [22,37]. Results from these studies clearly demonstrate the involvement of adipose tissue stromal/stem cells such as progenitors of endothelial, perivascular and smooth muscle cells in angiogenesis and vasculogenesis . Mutual physical interactions between endothelial cells (EC), stromal cells (or pericytes) influence vasculogenesis and vascular stabilization [22,38]. These observations provide information regarding the lineage of the cell types involved in the remarkable relationships between vasculogenesis /angiogenesis and adipogenesis demonstrated in several animal models [Table 1]. For instance, in an in vivo mouse model a, interactions between EC and preadipocytes result in reciprocal regulation of adipogenesis and angiogenesis . Furthermore, electron microscopic studies demonstrate interdigitating cell processes between EC, EC progenitors and pericytes that may augment interactions and developmental coordination during adipogenesis . In this regard, a novel vascular stem cell (VSC) theory proposes that ADSCs are a mixed population of vascular stem cells with differential potential for a given phenotype proportional to the angiogenic potential of the vasculature . The differential phenotype potential of VSCs can range considerably in a continuous as opposed to a discrete fashion and can include vascular smooth cells, EC and adipocytes . These observations are consistent with fetal adipose studies that show location dependent angiogenic potential ranging from more to less in regards to a predominant presence of EC and developing arterioles before overt adipogenesis . In fact, in fetal perirenal tissues, arterioles differentiate before development of adipocyte clusters such that capillaries and vascular stem cells mark or indicate the shape and location of subsequent adipocyte cluster development . In situ studies of human adipose tissue have demonstrated the presence of cells in the tunica adventitia of arteries and arterioles that were reactive for an antibody against CD34, an hematopoetic cell marker, but were not reactive for antibodies against endothelial cell markers, CD31 and CD146 [38,40]. These cells display reactivity for the antibodies CD44, CD73, CD90 and CD105 which are classic mesenchymal stem cell (MSC) markers . The antigens 3G5, a pericyte marker,and Stro-1, a mesenchymal stem cell marker, were also co-localized with confocal microscopy in perivascular regions around large blood vessels in human adipose tissue . The tunica adventitia contains CD34+ CD31-CD146-CD45- cells that natively expressed MSC markers and in culture developed multipotent progenitors similar to standard bone marrow MSC . Adventitial cells and pericytes remain phenotypically and genotypically distinct in vitro but in the presence of growth factors involved in vascular remodeling adventitial cells acquired a pericyte-like phenotype. Outer adventitial stromal cells, mature endothelial cells, endothelial progenitors and pericytes were expanded in vitro from human adipose SVF cells in parallel with unsorted cells as controls and each population was exposed to adipogenic media in parallel . Both endothelial cell populations showed little lipid accumulation compared to the unsorted SVF cells and only pericytes accumulated more lipid than unsorted controls . The outer adventitial stromal cells accumulated lipid but had less adipogenic potential than pericytes which may reflect their pericyte-derived nature. Therefore, adventitial cells around larger vessels represent a new anatomical location containing perivascular MSC progenitors. However it should be noted that adventitial stem cells are present in other tissues in addition to adipose tissue . Function and nature of adipose tissue stromal/stem cell secreted factors: proteomics. Adipose tissue stromal or S-V cells are the source for the majority of nearly every factor secreted by adipose tissue including cytokines, interleukins and angiogenic factors [reviews] [43,44,45]. For instance, comparison of secretomes, most commonly determined by ELISA using conditioned media (CM), indicated that majority of adipose tissue secretome factors were secreted by adipocyte explants or by S-V cell secretomes other than preadipocyte and MVEC secretomes . Secretomes, revealed that the most common secreted protein was VEGF and others related to angiogenesis (Table 2, ). Using a bioinformatic tool (ie., SignalP) that checks for signaling peptides [46,49], a study of rat adipocyte CM estimated 84 secreted proteins  and studies of human differentiated preadipocyte CM estimated 263 and 164 secreted proteins [49,50]. Fifty percent of secreted proteins identified in human ADSC media  and 36 percent of human S-V media secreted factors  were also identified in media conditioned by primary human adipocytes . The number of proteins in microvascular EC and preadipocyte secretomes were 7-fold less than the proteins in the secretome of whole adipose tissue which contained a majority of proteins related to angiogenesis. Examination of the secretory proteome of human adipose tissue S-V cells revealed an increase in the levels of 80 proteins during adipocyte differentiation . The cytokine secretory profile for human ADSC was similar to that for bone marrow-derived stem cells and included a number of angiogenic cytokines . Stromal-derived factor 1 is a particularly interesting cytokine expressed and secreted by adipose tissue S-V derived EC which when coupled with its receptor, CXCR-4, expressed by S-V derived progenitor cells, constitute an important adipose tissue angiogenic pathway . Function and nature of adipose tissue stromal/stem cell secreted factors: genomics. Many of the genes expressed by human ADSC were recently reviewed [review]. In particular, the influence of ASC differentiation per se on gene expression was examined by Verseijden et al . Cultured human stromal cells express and secrete a number of angiogenic factors including VEGF, PGF, HGF, ANGPT1, and ANGPT2, FGF-2, PDGFB, and TGFb1 . Gene expression of VEGF, placental growth factor, ANGPT1, ANGPT2, and protein secretion of VEGF significantly increased during short-term adipogenic differentiation of ASCs . Expression of FGF-2, PDGFB and TGFb1 by ASCs was not influenced by adipogenic differentiation whereas, as expected, FABP4 expression was increased in differentiating ASCs . Stromal cell conditioned media increased EC growth  and reduced EC apoptosis . In a comparison of pro-angiogenic and adipogenic medium (designed cell culture media), pro-angiogenic medium increased the expression of genes characteristic of primary endothelial cells (ie., eNOS, vWF, Jagged, CXCR4, CXCR12 and Notch4) in human S-V cell cultures . In contrast, significant down-regulation of these genes was observed in adipogenic medium. In addition, up-regulation of PECAM gene expression in angiogenic medium suggests an endothelial cells phenotype. Down-regulation of the adipocyte-genes genes, PPARγ1, PPARγ2, C/EBPα, ap2, leptin, LPL, CD36 was observed in S-V cells cultured in pro-angiogenic medium versus adipogenic medium . It should be noted that the adipogenic media did not contain serum but angiogenic media did contain serum whereas there was serum in the adipogenic media used by Verseijden et al . Therefore, the presence or absence of serum in culture medium would preclude any comparisons between these studies since a number of serum borne factors may influence expression of phenotypes. Microarray analysis was used to compare human S-V cells (preadipocytes) and adipocytes (AD) originating from adipose tissue of the same patient . Significantly up-regulated adipose genes included genes such as FABP, GPD1, LIPE, AGT and RXR. Genes expressed to a greater degree by preadipocytes (PAs) included fibronectin, matrix metalloprotein, and novel proteins such as lysyl oxidase . Several genes may be potential markers of committed PAs. This unique approach could be applied to ADSC and ASC to identify markers of these cells at the gene level. Genome-wide profiling of microRNAs during mouse adipose MSC differentiation into adipocytes indicated that 66 miRNAs were differentially expressed during differentiation . Future global studies of gene and miRNA expression are necessary to expand our understanding of the regulation of adipose stromal / stem cell interaction during adipogenesis. Several studies have indicated that VEGF gene expression and secretion in adipocytes and adipose tissue is regulated by hypoxia [review]. In cultured ASC's hypoxia selectively increased VEGF gene expression over HGF, GM-CSF, TGF-b and bFGF genes .When hypoxia treated ASC's were grown in Matrigel implants in vivo HGF, c-met, VEGF and PDGFB gene expression were significantly elevated with no significant change in bFGF and TGFb. expression . The elevation of angiogenic growth factor mRNA was accompanied by significant decline of anti-angiogenic factors, including thrombospondin-1 and endostatin . Therefore, hypoxia regulation of VEGF and and growth factor expression may be important in regulating angiogenesis in the context of adipogenesis  and may be a means to modulate or control the consequences of hypoxia during the expansion of adipose tissue. Human and animal studies on adipose tissue derived stem cell secretome. Vascularization  Mice-inguinal fat NR Cell extracts and CM Real Time PCR, ELISA HGF, VEGF, TGFβ. Adipocytes have been implicated as being an efficient energy storage cell type, sometimes associated with disease or metabolic dysfunctions, and are not the only cell type found in adipose tissue depots. Stromal vascular cells are also present, and have largely been used as a model for defining aspects of the adipogenesis process, but relatively ignored as important cells independent of adipogenesis. These S-V cells develop prior to adipocytes, in utero, and are found/isolated from adipose tissue depots postnatally. Consequently, S-V cells are present and active in the presence of fully differentiated adipocytes. The S-V cells are classically thought to function as adipocyte precursors, are a mixture of cells with proportions varying between depots and cell isolations, may dictate the (actual) structure of the adipose depot, may regulate signals synthesized/released from the same depot and likely plays an important role vascularization of the depot and surrounding tissues. Proteomic and genomic studies are just being devised to study these cells and their potential as a tissue-organizing population of cells. Moreover, use of these cells as a source of cells capable of forming other cell types is just now becoming popular and reasonable. Due to the numerous characteristics ascribed to these cells it is not surprising that the S-V within adipose depots may actually regulate adipogenesis and many other cellular, molecular and physiological processes. ADSC: adipose tissue derived stem cell; VSC: vascular stem cell; EC: endothelial cells; ASC: adipose tissue derived stromal cell; MSC: mesencyhmal stem cell; AD-3: a monoclonal anti- adipocyte antibody that identifies a cell surface antigen on preadipocytes before lipid accretion.